Kids Make Your Own Slime! I’m not following anyones recipe for this, just experimenting. You start by pouring some white glue into the small bowl. You can make as much as you want…we chose to just make one color, we were running out of time, Mariahs’ mom was coming to pick her up! Then we stirred..Be sure to mix them really well. If your not sure how much water…just add a bit at a time. You just want it to not be so thick, but you don’t want it runny either.We then added a couple of drops of coloring at a time, to reach the color you want. Mix really well. Once you reached the color you want….start adding small (we used the cap from the starch) amounts of starch at a time. And stir….we added 5 more cap fulls. But this will differ according to how much you are making. Keep mixing. It’s getting there. At this point, it will start looking like this….keep stirring. You are making it turn thick and not sticky. Still sticky, we don’t want it to be sticky…so we added another cap full of starch and kept stirring. 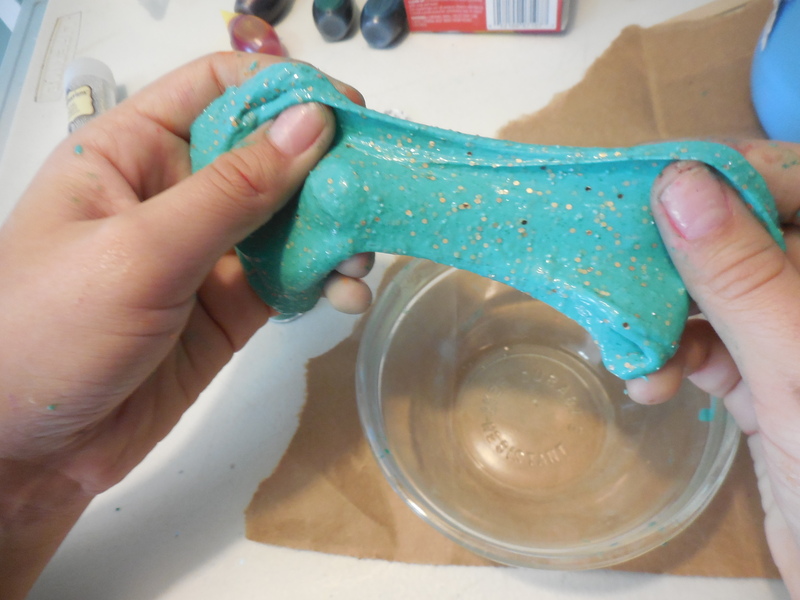 So now we have a glob of slime, but Mariah wanted glitter….so we made a well in the center, added glitter….and stirred it in well…and this is what you get…..slime! This was a very easy craft to do. Easy and fun for kids. Be sure to store in a tightly closed container. The kids love the slime! It’s sold all over in the stores. Kits to make. Why spend good money buying, when you can do it yourself, for pennies. I took pics and hope i have them still in my harddrive. I need to share the recipe. Your right the love it and its inexpensive and easy to make. ?There is so many ways to make it too. Shaving cream is a biggy too! I believe the call that one elephant slime..lol id have to ask my nieces. Ours was glue borax water and food colouring. Kids do keep you young. I thought at first you were a pre teen. Knowing all those slime names! Better than me! I didn’t know they had names. I wonder what mine is called. That is awesome! Kids love slime! The glitter was Mariahs idea….looked really pretty…pics aren’t so great! ❤️️☺️ Glitter Slime it is!